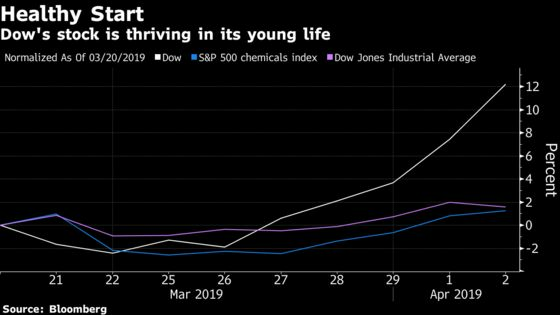 (Bloomberg) -- Dow Inc. surged on its first day of trading as an independent chemical company as investors flocked to the lure of an industry-leading dividend. Dow gained as much as 7.3 percent compared with “when-issued” trading that preceded the distribution of the new stock. With its spinoff from DowDuPont Inc., Dow replaces its former parent in the Dow Jones Industrial Average, maintaining the index’s exposure to the materials sector, according to S&P Global Inc.
Dow Chief Executive Officer Jim Fitterling, 57, promises to spend less on new factories and return 65 percent of net income to shareholders through stock buybacks and a hefty dividend. The new Dow is more focused than the one that merged with DuPont in 2015, having shed agriculture and other units in the process of winnowing 15 businesses down to six. Plastics and packaging now account for about half of revenue and earnings. Dow’s plastics business is approaching a cyclical low that is set to rebound in 2020, Koort said as he initiated the stock with a Street-high $71 price target. The shares will pay a “best-in-class” dividend yield of about 5.6 percent, he said. Analysts initiated Dow with eight buy recommendation and three holds, making for an average price target of $61.54, according to Bloomberg data. Dow’s increased focus will allow it to be more productive and generate more free cash for shareholders, Fitterling said in an interview on Bloomberg Television. The company’s plan to pay out $2.1 billion a year, a yield of about 5 percent, is “sustainable,” he said. Shares rose 3.8 percent to $55.52 as of 11:05 a.m. in New York. Dow’s separation has been in the works since Dow Chemical Co. and DuPont Co. agreed to merge, temporarily creating the world’s largest chemical company. The plan from the start was to redivide into three new companies focusing on commodities, agriculture and specialty products. Dow’s near-term earnings outlook recently weakened. DowDuPont last week said Dow’s first-quarter earnings will drop by about $100 million more than previously forecast, largely because of narrower plastics profit margins. Production in the U.S. is rising faster than the market can absorb mainstay resins like polyethylene, which is used in consumer packaging and bags. Plastics prices have stabilized after a small drop in the first quarter, and pricing should be “more constructive” in the second and third quarters, Fitterling said in the interview. Supply-demand balances “look good” and sales volumes are starting to pick up, he said. “There is good momentum into next year,” Fitterling said. Dow’s outlook is clouded by trade tensions with China and a backlash against plastic waste that’s prompted a global wave of bans on bags and other single-use plastics, eroding some the industry’s historical growth. Still, the company aims to increase earnings as much as 30 percent in the next few years through targeted investments and cost cuts. The final step in DowDuPont’s breakup comes June 1 when it peels off the agriculture division, to be named Corteva Inc., leaving DuPont as a stand-alone company.